Thursday June 1st 1899 Will churned for me before he went to town this morning. I was busy with the work all forenoon and sewed a little in the afternoon. Weather growing very warm. The boys are plowing corn today. Ott & Fanny married 12 years. Friday June 2nd 1899 I got an early start to town with the butter. I went over the river awhile and was ready to start home at ten oclock. I got the dinner and sewed in the afternoon We had a very hard rain about six oclock. Saturday June 3rd 1899 Charlie H- went away for good this morning. I was busy sweeping most of the forenoon I did some extra cleaning in the afternoon and sewed a little. Will fixed the squash patch and Luther is replanting corn. Weather is growing very warm. 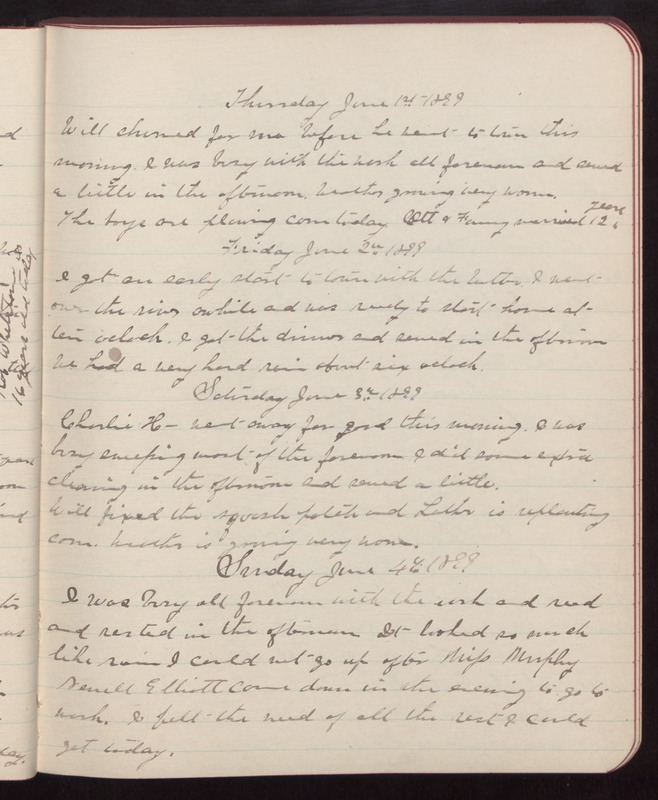 Sunday June 4th 1899 I was busy all forenoon with the work and read rested in the afternoon It looked so much like rain I could not go up after Miss Murphy Newell Elliott came down in the evening to go to work. I felt the need of all the rest I could get today.